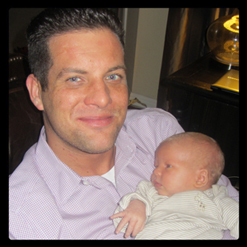 Lucas Vandenberg and his wife gave birth to their first child, a beautiful and healthy little boy, on October 14, 2012. "Life changing events, such as the birth of a child, really helps put things in perspective and is a good reminder of the things that are truly important in life" says PSM President Lucas Vandenberg. Running a successful organization has many similarities to cultivating a healthy family unit. All relationships, both personal as well as professional, are based on trust and communication and we hope these are qualities you’ve experienced working with our organization. They have thoroughly enjoyed their first month with Grant and all of the changes that come along with welcoming a baby to the family. If you have any tips or suggestions for Lucas and his parental journey, your feedback is welcomed and appreciated. Precision Senior Marketing wishes all of our agents and their families a happy and healthy Thanksgiving. Our offices will be closed Thursday, November 22nd and Friday, November 23rd. We will reopen Monday, November 26th with our normal working hours. Medicare officials have begun sending letters trying to nudge seniors out of the 26 medical and private drug plans that have performed with either a "poor" or "below average" rating from CMS in the last three years. The letter reads, "We encourage you to compare this plan to other options in your area and decide if it is still the right choice for you." Approximately 375,000 Medicare Advantage and 150,000 drug plan members have received this notice. This is the first time Medicare officials have made an effort to warn beneficiaries about their medical and private drug plans while still allowing the companies to remain operational. They are, however, encouraging people to sign up with different companies other than the 26 plans falling "below average." On Medicare’s finder website those plans are not only marked with a warning sign but are not available to sign up electronically and force the senior to contact the insurance company directly in order to sign up for the plan. Also, in the future, some of these plans may be canceled if their company continues to perform below standards. Isabella Leung, a Medicare spokeswoman said "We want to make it easy for beneficiaries to find and select the highest quality plans, and discourage people from staying in chronically low-performing plans." However, Robert Zirkelback, a spokesman for America’s Health Insurance Plans, argues that the letter to beneficiaries is premature because the rating system is flawed. He sites that the rating does not take into account plans serving a disproportionate number of seniors who have chronic illness or special needs or who live in otherwise medically underserved areas. He urges, "It’s important to make sure we get the measures right before we move on to these other steps." Medicare officials understand that some seniors will simply ignore the warning, especially if they are satisfied with their plan, or if the price aligns with their income and their network of doctors. Leslie Fried, director for policy and programs at the National Council on Aging sums up, "If people are satisfied with their plan and it is currently contracted with CMS, isn’t that a decision they should be allowed to make?" Do you think it’s the government’s responsibility to let your clients know about the low ratings? Do you feel it will negatively or positively impact your business? As the Presidential race draws to a close most people have chosen which candidate they are going to support next Tuesday in the election. One of the main topics this election season has been health care, with Medicare being a heated topic. The candidates differ from how much the government should be involved, to where the funding should come from, and in the case of Medicare, at what age beneficiaries should become eligible. Here are a few key differences to consider about the future of Medicare and Medicaid based on each of the candidates’ platforms. Obama: Says that PPACA (Patient Protection and Affordable Care Act) has already made important changes for Medicare. Things like requiring basic Medicare to include basic preventive services to patients and reducing the size of the Medicare Part D doughnut hole. With his plan, the Medicare system would be structured the same way and begin at the same age that it does currently. Obama: Under his plan, Medicaid would work the same way it does currently. With only a few days left, most of us are excited and anxious to see what the outcome will be. For sports fans, that result might come a little bit sooner. Since the 1984 election, the winner of the Alabama-LSU game has coincided with the party who has won the election. With Alabama’s wins aligned with the Democratic Party and LSU with the Republican. Obviously, statistics are made to be broken, but it still adds another element of intensity to the SEC game this weekend and gives friends and family something to speculate about. Hopefully you are having a productive and prosperous AEP so far. Remember that your marketer at PSM is available to answer any questions that arise and help you with any issues you encounter. Just give them a call at 1-800-998-7715. Which candidate do you think has the better plan for Medicare? Do you think a voucher system is a good idea? If not, why? Do you think a state-controled program would better regulate the system? If not, what would?